REGISTER: Click here to visit our Event Registration page. Scroll down and click the “Register” button under the Net Zero Case Studies event listing. Exhibit Opening is Friday, November 11 from 6 – 8 pm at the St. Louis Artists’ Guild (Two Oak Knoll Park in Clayton, MO – 63105). This is the Chapter’s monthly program for November and no RSVP is required! Please join us! Sustainability and the Built Environment of the St. Louis Region is an all-encompassing, all-media exhibition exploring where we stand, as a culture of consumption, and where we may be headed in the future. It is part of the Artists’ Guild Aggregate Exhibit Series, a group of six exhibitions in which artists, architects, and designers examine our culture of consumption and possible solutions for establishing long-term ecological balance. Several different approaches to the themes of consumption, conservation, and sustainable living will be included in this exhibition, including Visual Art, Architecture and Design and Community Projects. This exhibition is juried by Chris Jordan. These award criteria have been adapted from the Leadership in Energy and Environmental Design (LEED) green building certification system developed in 2000 by the U.S. Green Building Council. The “Sustainability 2011 Award” is not a commentary on the artistic or purely aesthetic value of the artwork. The focus, instead, is on the artwork as an expression of sustainability efforts and opportunities. 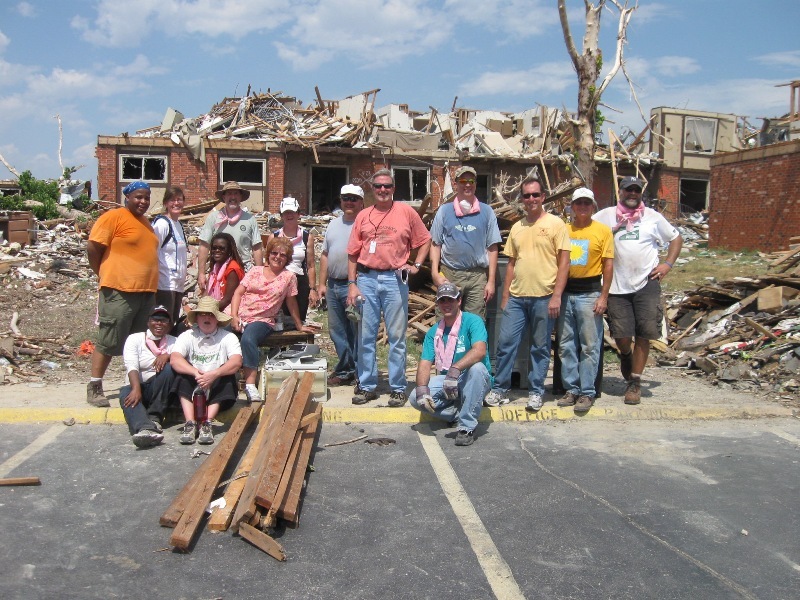 On July 23 – 24, under the solid leadership of Pat Justis, USGBC-Missouri Gateway Chapter members and volunteers headed Joplin, Missouri to assist in general clean-up efforts. Eleven of us arrived at the well organized volunteer center and were quickly put to work clearing debris and organizing clothing. The news coverage outside of Joplin has not conveyed the magnitude of the destruction that took place or the ongoing needs of the people of Joplin. Try to imagine neighborhoods about three times the size of Forest Park simply scraped off the ground. For blocks and blocks, nothing remains. Wind speeds exceeded 300 mph – some of the highest winds every recorded. Sewer pipes were lifted out of the soil. A concrete framed seven-story hospital shifted 6” off its vertical, severing every joint and connection in the structure. Today, debris piles line streets waiting for FEMA-sponsored trucks. The highest pile I saw was over three stories tall; matchstick ruins of people’s homes and businesses. All told, over 8,000 structures were deconstructed in about 12 minutes, 170 people lost their lives, and upwards of 20,000 people were displaced. The need for volunteers will likely go on into next spring. Our group was surprised the that loss of life was not greater given the scope of destruction. At the 200 unit apartment complex we worked at, every building’s roof and second story was simply pushed off the first and strewn in the adjacent yards. How did only 1 person die out of 200 families in buildings that simply blew apart? Stories of real miracles abounded and I for one have no idea how so many peopled simply walked away from that evening. Our efforts at removing and sorting debris at times seemed futile given the need. We recycled metal and construction debris, much of which was being reused to make small sheds and temporary shelters. Some of us collected personal items- toys, photos, and medical records of past occupants. The Red Cross was leading an effort to connect personal items with their owners, most of whom lost all of their belongings. way to lend a hand! Larger questions remain. Clean up is far from over. What to do with the remaining land is in limbo. Property values are baseless after so many people have moved away and the City has no idea if it will be solvent in a year for lack of tax revenue. Brand new schools were destroyed. This fall, children will be attending high school in an abandoned big box shell. All given, it was an eye opening and educational trip. We helped in the clean up effort but much remains to be done. Our neighbors in Joplin will need help for months to come. USGBC-MO Gateway will likely organize additional trips to Joplin to assist with clean up. Please contact emily.andrews@mobot.org if you’re interested in being notified about the next trip.